Spring weather can be so weird. One day it's warm and you only need a light jacket, but the next it's snowing and windy and you need your puffy winter coat once again. This spring in particular seems colder than ever, which might be due to actual temperature or might just be due to my decreasing tolerance to chill. Last year, it seemed like my training for the Cherry Blossom 10 mile race was much warmer than that of this year; I've been wearing multiple layers for the past few weeks. Plus, after years of living in the South, my blood has definitely thinned and I'm so much more sensitive to cold than my New England upbringing should allow. With such fickle weather, hearty cold weather dishes hardly seem appropriate, yet light warm weather dishes don't fit the bill either. Enter: cold weather tacos. Inspired by GP's March Goop "One Pan Meals," these sweet potato, black bean, and kale tacos strike just the right balance between comfort food and light fare. They're spritzed with lime juice, served in warm tortillas, and topped with sour cream and avocado, so they have all the great aspects of a taco, yet encompass the soft, warm characteristics of comfort food, so they're perfect for a cool day. To make them, peel and cube a sweet potato into bite size pieces. 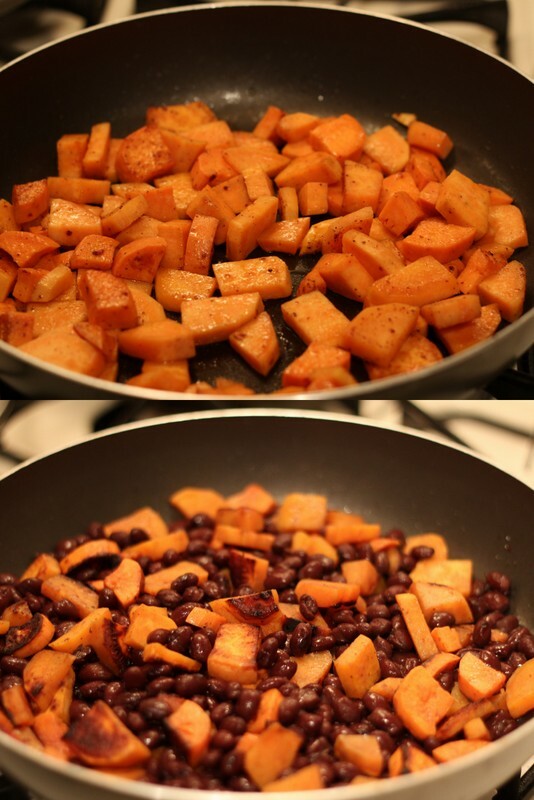 Heat olive oil in a large pan over medium-high heat and add the cubes of sweet potato. Stir occasionally, and cook until soft and slightly browned. Add a can of black beans, drained and rinsed, and cook until warmed. Season with sumac (if you have it - this can easily be skipped if you don't), cumin, salt, and pepper. Prepare several stalks of kale by rinsing it, tearing off the stems and large veins, and ripping it into small pieces. Add a couple extra tablespoons of olive oil to the pan and add the kale to the sweet potato/black bean mixture. Stir occasionally until the kale has cooked down. Continue stirring until the kale is completely wilted. Serve the mixture in a warm tortilla. Squeeze a wedge of lime over the ingredients and top with a dollop of sour cream and slice of avocado. One thing I like about this dish is that it can be eaten as a taco or you can enjoy only the filling in a bowl if you prefer. I did this with leftovers, but still topped it with lime, sour cream, and avocado. Delicious and so portable. Enjoy, and start preparing for warmer weather! In a large saucepan, heat 2-3 tablespoons olive oil over medium-high heat. Add the sweet potato and cook about 10 minutes, stirring frequently. Add black beans and cook for 5 minutes longer. Season with sumac, cumin, salt, and pepper. Meanwhile, rinse the kale, remove all stems and large veins, and tear into bite size pieces. 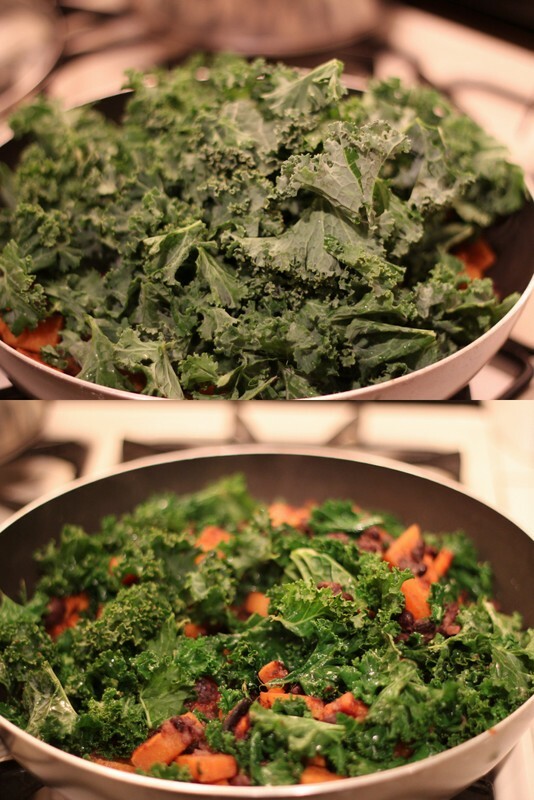 Once sweet potato and black beans are done, add an additional 1-2 tablespoons olive oil to the pan and add kale. Stir occasionally until kale is completely wilted. Serve taco mixture on warm tortillas, squirted with lime and with a dollop of sour cream and slice of avocado. I made this and added garlic and green onions with the kale. Superb, and healthy without the sour cream.